Grab your hard hat and get ready for a day of construction fun with a busy builder and his friend! Get ready for a day full of construction fun! Children can follow a busy dog builder as he sketches and plans his dream, clears rubble to make space, and gets to work digging, lifting, and sawing. He builds a house for himself and his bird friend, and satisfied after a hard day's work, they takes in all they've done and look forward to the next day of building! Meg Fleming has built many wonders in the field of construction. Her greatest architectural achievement is a 17-foot gum wrapper chain that she made in the car when she was eleven years old. She loves hatching ideas, then building . . . and building . . . until they become her favorite thing: a story. Meg writes from her home outside of San Francisco, California, with her husband and kids who build things out of wood and wheels, flour and sugar, and bits and bytes. She also has a dog who always wears a hardhat. Please visit Meg at MegFleming.net. Jarvis is the author of Lazy Dave and Alan's Big, Scary Teeth. Jarvis has always doodled wherever his career has taken him, from graphic design student to record jacket designer to animation director. He lives in a very leafy and quiet part of Northern England with his girlfriend (who tells him what's good/bad and pretty much gives him most of his ideas) and his cat, who rips those ideas into tiny pieces. Find out more about Jarvis at byjarvis.com. 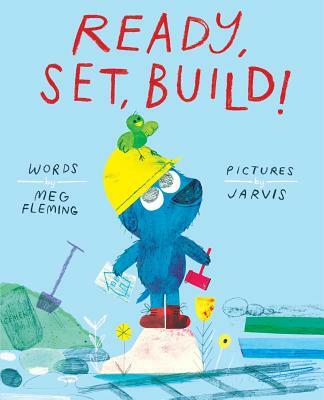 A lively and fun rhyming adventure for every little builder by award-winning illustrator, Jarvis. Follow Dog and Bird as they build a home together - from sketching the building, to clearing the rubble, digging and using the machinery. Everything must be done just so... will the house be finished by the end of the day? Wonderful illustrations are full of interest with lots of intriguing details to spot and enjoy. Hi-ho, hi-ho, it's off to work we go! Say hello to a playful bunch of little adventurers in this funny, rhyming picture book from author Meg Fleming and award-winning illustrator Jarvis. Warm, whimsical and full of Jarvis' distinctive, bold and painterly illustrations in a textured colour palette, this is a joyful and entertaining story about working hard, having fun and discovering the joys of a job well done.